A super cool wagon for outdoor use. Kids love nothing more than carting their toys and dolls around or helping grown ups with outside activities – so what better way than with this wagon! Hours of fun are guaranteed! 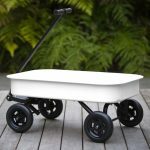 The kids steel wagon is a wonderful way for the kids to help Mum and Dad out in the garden.